The team led by world-famous architect Xavier Vilalta that developed the winning project in the competition for a new central market in Addis Abeba, Ethiopia, has reason to celebrate: Lideta Mercato, built between 2010 and 2017, has been awarded the UNESCO Prix Versailles for the world’s best shopping centre. Addis Abeba, Ethiopia. It took seven years to build, but it seems it was worth it. Lideta Mercato, a project by Vilalta Architects that won a competition held ten years ago, has been named the world’s best shopping centre according to the Prix Versailles, which presented Xavier Vilalta’s studio with the UNESCO special prize in 2017. The project is built on a considerable scale: more than 14000 sqm on nine levels, the last of which is a public terrace, as well as two levels of underground parking. The design process was all-inclusive and multi-faceted, drawing inspiration from the local community and rural Ethiopian art while focusing on the building’s contemporary style and ecological sustainability. Xavier Vilalta started out by studying other shopping centres in Addis Abeba in order to identify their critical points, particularly temperature, ventilation and lighting conditions. The cases studied revealed a prevalence of enamelled and glass materials that let too much heat and light into the interiors. Vilalta’s intuition was to draw inspiration from the Old Mercato, Africa’s biggest open-air bazaar, in the planning of the new shopping centre, preferring a large number of small shops appropriate for local retailers rather than concentrating on just a few luxury shops owned by big brands. On the ground floor, the Lideta joins two parallel streets with a diagonal line formed of entrances at opposite corners of the layout. This pedestrian shortcut guarantees a constant flow of people and an alternative use of the building. In the middle of the volume, an empty space joins all its levels right up to the sky with a big circular staircase, the axis of which shifts on each floor. This empty space permits air to circulate according to the laws of thermodynamics. 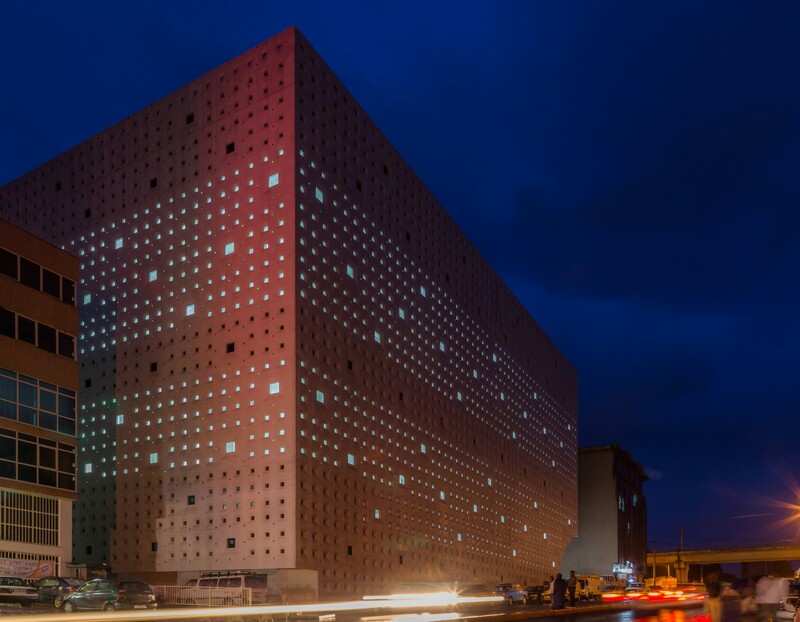 The building as a whole is imposing, with its squared-off rectangular shape, but the architects skilfully found a way of combining functions and aesthetics with an element representing local culture: a fractal geometric pattern made up of square of different sizes which appears frequently in the fabrics of traditional Ethiopian clothing. The pattern was extrapolated, processed and applied as openings in the outer cladding of the Market. 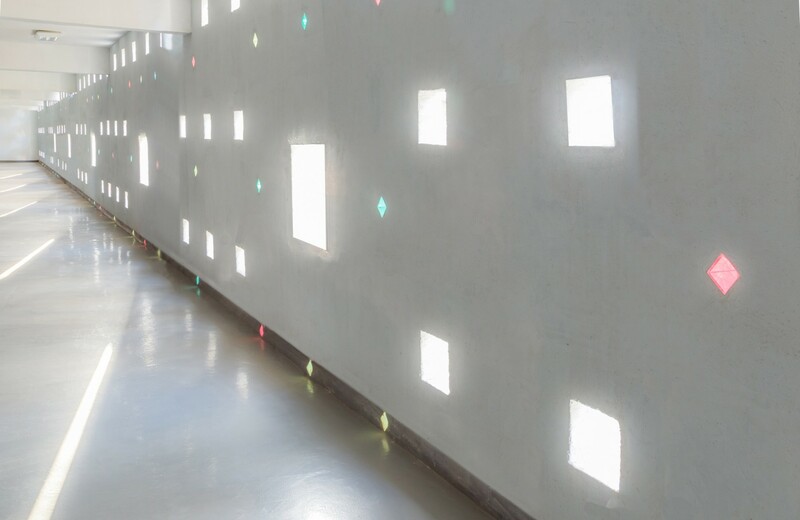 The façades of ultra-light pre-compressed concrete become sunbreaks to stop excess light, while the square openings in them ensure enough light and air circulation in the building on each level. Last but not least is the terrace. 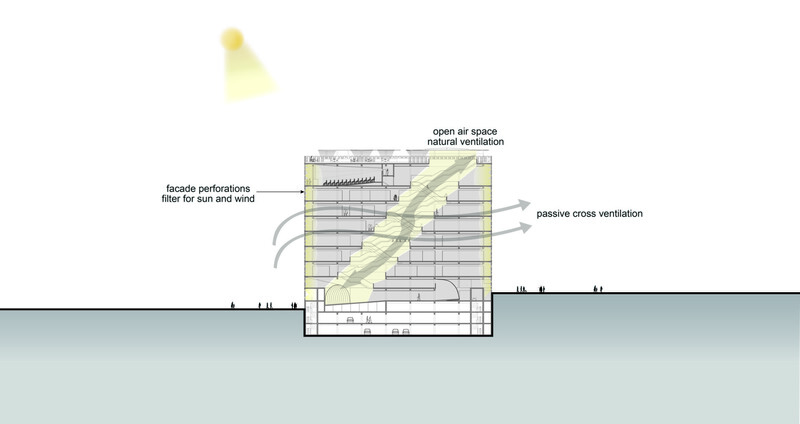 Positioned at considerable height, it not only keeps a distance from the traffic and smog, but acts as a recreational place and serves functions that improve the building’s energy efficiency. In addition to collecting and filtering rainwater for reuse in the toilets, the terrace has photovoltaic panels for generating electricity. Vilalta has given them the shape of big mushrooms under which people can find shade and refreshment. One of the biggest problems with large buildings in this part of the world, the intermittent electricity supply, is thus solved in an ecological way while creating added value for users. The clients originally wanted a glass complex, which could easily become overheated, but the holistic design and focus on detail of the Lideta Mercato plan convinced them to change their minds, significantly cutting construction and operating costs. This is achieved through use of concrete, which is cheaper than glass, and elimination of the need for air conditioning. At the same time Vilalta gives the Mercato an identity that mirrors the local culture, offers investors greater returns, and creates more shops of smaller size which can easily be stocked and will sell inexpensive products affordable to all the people of Addis Abeba. As always, good design leads to an improvement in living conditions for everyone involved.